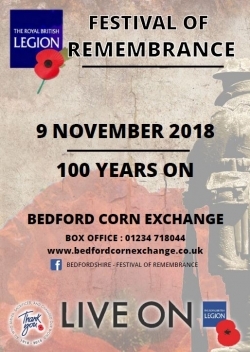 The Royal British Legion Bedfordshire welcomes you to a special performance to commemorate those who have lost their lives in conflicts past to say “Thank You”. This year, 100 years on, we invite you to come and join us to commemorate the end of The Great War-all who served, sacrificed and changed our world, for an evening of music, song, poetry and special memories. Performed by a 200 strong cast of choirs, Singers, Bag Pipers and Musicians, who are all volunteering their time, for an unforgettable evening. The performance will of course embrace the Act of Remembrance with time to reflect and give thanks to our fallen heroes. Music will include well known favourite's by The D Day Darlings, Bedford Pipe Band, Military Wives Choir along with the Bedford Chapel School Choir. All proceeds will go towards the Royal British Legion Poppy Appeal.